Lots of you have been getting engaged over the festive period and with many more gorgeous couples set to get engaged over the the next month or so (can you believe Valentines day is just around the corner?) we are keeping the engagement shoots coming. Nothing has made us happier than listening to all your stories and we would love to hear more, so if you haven’t told us your engagement tale be sure to let us know all about it in the comments below. For today I would like to share Ashley and Taylor’s engagement shoot with you! Photographer Sarah Tyler described them as a”truly amazing couple, so in love and really such best friends”. I love the fact that they chose to hold the shoot at Taylors workplace, it obviously makes up a very large part of their lives and so why wouldn’t they want to include that in their day? What could be better than marrying the girl of your dreams and having the job of your dreams? The couple are totally adorable and totally in love and huge bonus points to Ashley for the polka dot skirt – this girl has style! How They Met. I met Taylor in 2007 after meeting at the pool at the apartment complex we both lived in. He was 20 and going to school to be a firefighter, I was 19 and also attending college. After spending some time together, the we quickly fell in love. The Proposal. It was any old Monday and my best friend asked me to hang out that morning which I didn’t know was set up by my soon to be fiance so that he could prepare the house for the proposal. When I arrived home I found rose petals and candles leading up the stairs. I walked into our room and found candles and roses everywhere and then rose petals that spelled out “Will You…” with Taylor and our beloved pug Darla standing there. Taylor had dressed Darla up in a white flower girl dress and a pearl and diamond collar. Darla ran over to me and when I picked her up I found a gorgeous diamond ring hanging from her collar. Taylor dropped to his knee, like a true gentleman, and asked me to marry him. Doesn’t that just make you go ‘awwww’! How sweet are this couple! Wishing them all the love in the world and I cannot wait to see what they have planned for the wedding! What a beautiful story! The pictures are amazing Sarah Tyler is a very talented photography. Looking forward to seeing what else she does this year! 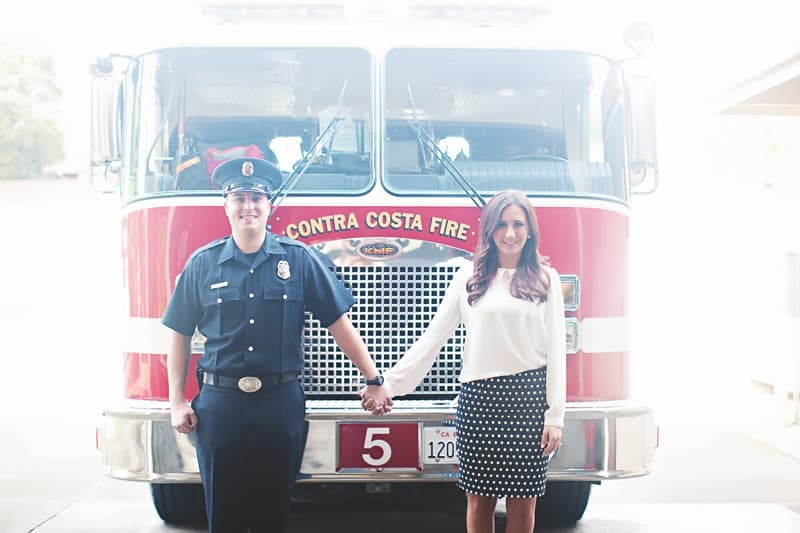 What a wonderful idea to have their engagement shoot at the fire station! It really adds a nice charm to it and makes it really special. I love the first one the best! Gorgeous pictures! I love that they took them at the firehouse. There’s so much personality and affection here. Congrats! I love this shoot, and love ALL of Sarah Tyler’s shoots, what’s not to love?!?!? You are such a great photog Sarah!!!!! Wonderful photos and beautifully captured the story of the couple. Now I’m kind of considering making my husband become a fireman, and then flying Sarah out to recreate this shoot. It is just that gorgeous! Awesome feature, gorgeous couple, just a genius concept all around. What an adorable couple! Like everyone else, I totally love the firehouse setting! Great idea, and another awesome shoot by Sarah Tyler. She did a wonderful job mixing their engagement with the setting and I’m sure these pictures will be cherished for years to come! Sarah Tyler is very talented and made our photo session very comfortable and had all the best ideas for the perfect photos. I am so happy she took our engagement photographs because they turned out better than I could ever imagine. Thank you, Sarah Tyler, for the amazing engagement photographs. Sarah Tyler is not only a fabulous photographer with an amazing eye, she’s also a dear friend. So blessed to be a part of her photography journey. She is abouslutely the sweetest most talente gal I know. Her work is so special in so many ways. We all want to capture these special moments and freeze time. Sarah’s work gives you something special to cherish forever. I just adore her and her work and can’t wait to see what she does next! Wow, what an incredible story! The pictures truly express their love story and who they are as a couple! Great photography. What a sweet story! The pictures are amazing. Love Sarah’s work. She is an amazing photographer and always tells beautiful stories with her photos. These are some amazing pictures. They truly capture the couples relationship. The love, them as individuals, and as a couple! I am so impressed!